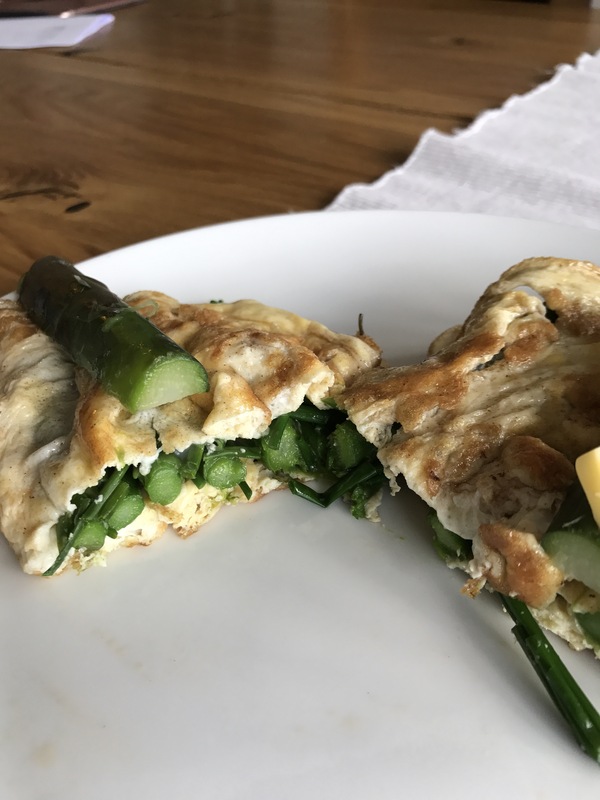 Asparagus season is well and truly underway and the bed is very productive this year and almost producing more than I can use but I’m finding new ways to eat it. I used this morning’s crop to make omelettes for breakfast. 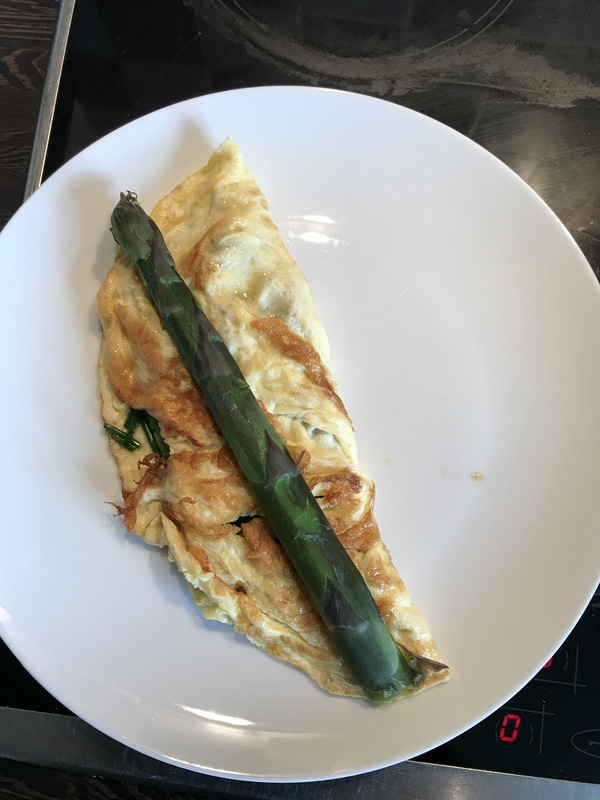 I boiled the asparagus first and the simply folded the spears into an omelette and added some snipped chives too. Easy. 10 minutes maximum from start to finish and it looked great IMHO. Next time I will add some grated cheese into the middle of the omelette to make it a little richer as I was hungry again three hours later. I saved the trimmings from the asparagus spears and the water it was boiled in as it will make delicious soup with the bone broth from tonight’s chicken. You’d be surprised how much flavour the spears leave behind in the water. 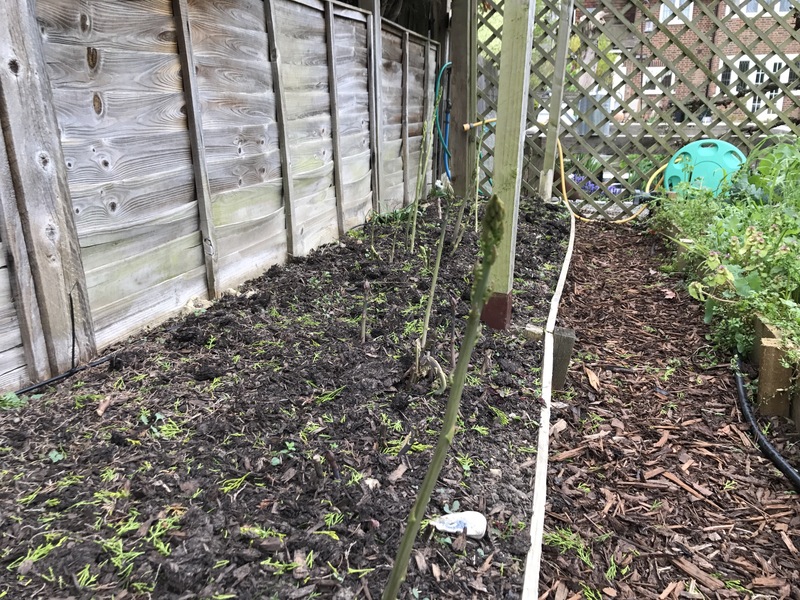 Wonderful asparagus! It’s the gift that keeps on giving. Basically you can do four things with the calories you eat. You can burn them for fuel; use them to build stuff: waste them; or store them as fat. It doesn’t matter what kind of calorie they are, your body simply decides and decides the same way constantly, whatever. Obesity then inevitably occurs when the burning and the using of the calories does not equal or exceed the consumption. We store the excess as fat. But our bodies are not a bank account, the human body is a complex metabolic factory and its treasure is fat. The partitioning of calories is subject to hormonal signalling and fat is not an inert tissue! It is biologically active. Fat (adipose tissue) can increase insulin release into the blood stream which instructs the body to store energy (not just excess energy but ANY energy) fat. The partitioning system also responds to the type of food we eat. Carbohydrate intake also raises our insulin levels that, guess what, instructs our bodies to store fat (eating fat, by the way, doesn’t). And just so we understand how elegant this system is, insulin starts to rise before the food is even in your mouth. Sit next to someone on the train eating sweet porridge and you start secreting more insulin and that’s not an good feeling. I know that from experience! Front and centre of the problem is the partitioning system, choosing to use or store calories based on the signalling it is getting from the food we eat and the metabolic state of our bodies. The more carbohydrate we eat, and unfortunately, the fatter we are, the more energy we will store as fat rather than use for fuel. This is the function of a single hormone and there are many hormonal interactions in reality. The ability of human beings to store fat (I have never seen a fat buzzard) is an evolutionary genetic triumph that has made us the successful species we are. Its a tragedy that modern food has turned it it an evolutionary disaster that is reversing medical gains and is now starting actually to shorten human life expectancy. Did fat shaming just become acceptable? 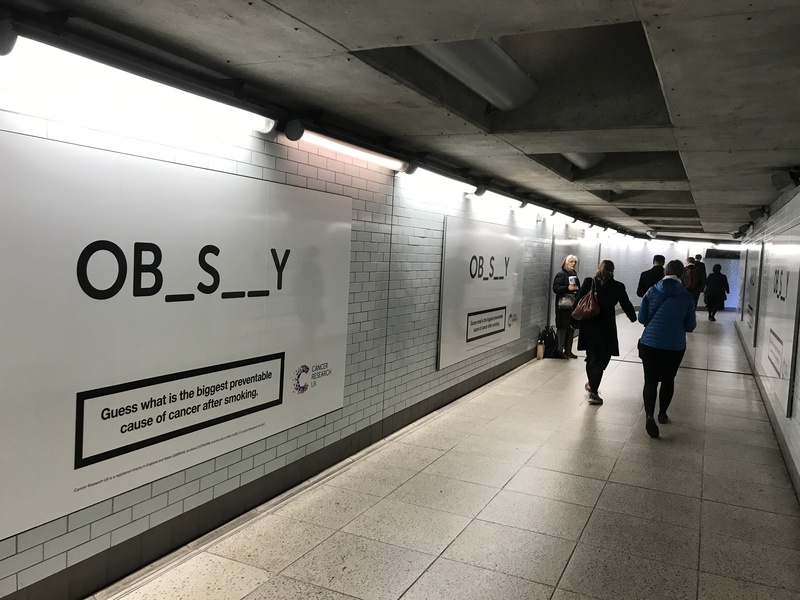 I was a little bit taken aback by the latest advertising campaign from Cancer Research UK which I discovered on my way to somewhere else. 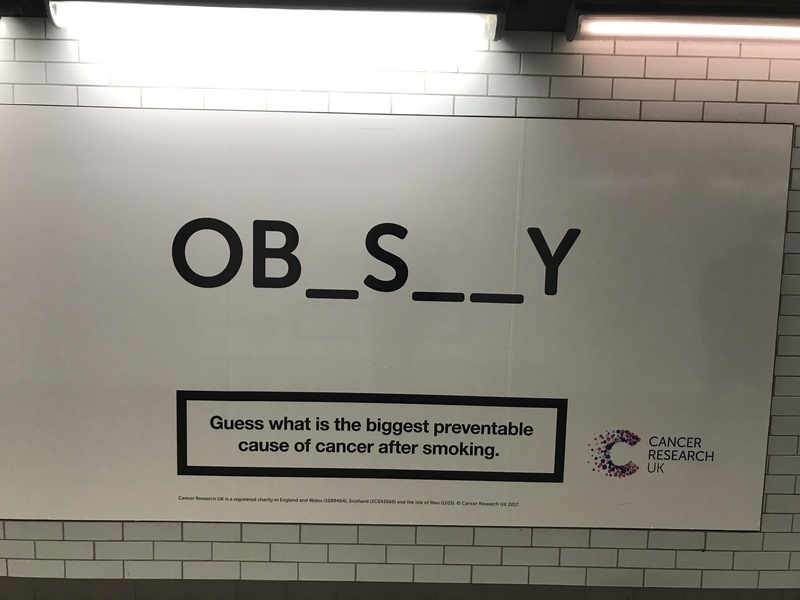 I didn’t really understand what the message is… apart from obesity causes cancer… it can’t be “if you are obese and you get cancer it’s your fault” can it? Really? And on both sides of the subway. No one seemed very interested though, apart from me. Clearly if you thought you might be obese, you had the potential to be quite shocked at the thought you also had a high risk of cancer. 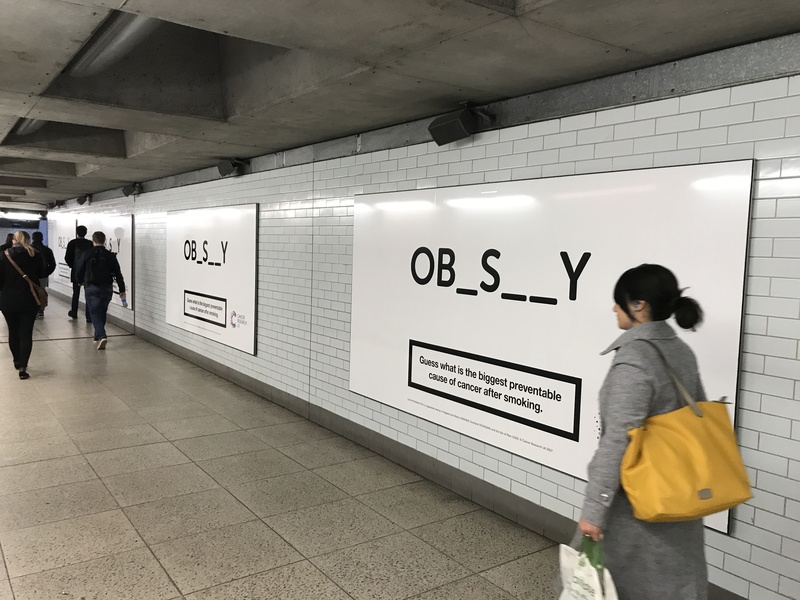 But the message came without any suggestions about what you should do about it if you are at risk, no suggestions about where to go for help, not even any indication about what obesity is and whether the person looking at the advert should consider themselves obese. All in all, and whilst I agree that people do not understand the risks of being obese, this is a pretty unhelpful approach in my view. People need help, not shaming, Cancer Research UK.